In his book Paper Machines: About Cards & Catalogs, 1548-1929 (MIT Press, Cambridge, MA, 2011) Markus Krajewski tells the fascinating story (to a library history buff) of how the idea of putting information on individual pieces of paper and filing them in a prescribed manner became a significant tool in the world of business in the U.S. and Europe. Krajewski's story begins with Konrad Gessner, a 16th century doctor, and the methodology he used to compile his publication Bibliotheca Universalis. It is Krajewski's description of the role played by the Library Bureau company, founded by Melvil Dewey, in transferring library catalog card methodology to the business world, however, that I found most interesting. Krajewski recounts both the development of the use of catalog cards by libraries in the U.S. and the early struggles of Library Bureau as a business. Krajewski reveals that it was E. W. Sherman, a female accountant working for Library Bureau, and not Dewey, who recognized the practical application of library catalog card filing methodology to business. Her experimentation with the use of catalog cards for accounting records was the initial stimulus for Library Bureau's expansion into the business world which proved immensely successful. Krajewski writes: "In 1909 Library Bureau controls more that 10 factories, 32 agent offices in American and European cities, and 3,000 office workers. A small department for library supplies overcomes financial plights and turns into a thriving corporation, opening a hitherto virtually nonexistent market." The business world adopted the methodology of the catalog card and index to such a degree that by 1929, the ending point of Krajewski's history, a card file is on practically every business desk. Krajewski quotes this testimonial from a 1929 German business equipment catalog: "Card catalogs can maintain order among tens of thousands of small and large items in the warehouse management of large industrial plants, they can structure any number of addresses in personnel departments, they can control the movement of hundreds of thousands of people in urban registration offices, they can make themselves useful in bookkeeping departments of commercial offices, i.e. as open account catalogs, etc. etc. Card catalogs can do anything!" Markus Krajewski is Associate Professor of Media History at the Bauhaus University, Weimar, Germany. 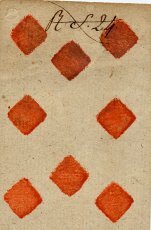 I first became aware of his work when he commented on one of my most popular posts about the playing cards repurposed by the French as library catalog cards in the late 18th century. My description of Karjewski's book doesn't do it justice. I highly recommend that you read it yourself. 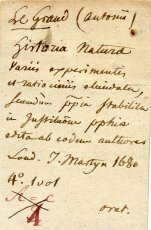 The 18th century french catalog card repurposed from a playing card shown below is from my collection of three such cards. In spite of some automated messages to the contrary, Gleeson Library—as of approximately 3 pm—has power, and is open for business. The power situation may be unpredictable, so if you’re coming from a distance, please contact us to verify we’re still open. (If the power goes down again, it may take some time to change this message). We are currently working on getting our catalog and databases back online and available for off-campus access. The United States declared war on Germany and entered World War I ninety-five years ago this month. 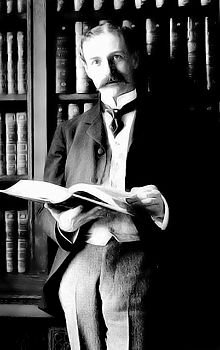 In the same month Herbert Putnam, Librarian of Congress, initiated events that led to the creation of the American Library Association's Library War Service, perhaps ALA's most ambitious and successful undertaking in its history. According to Arthur P. Young in Books for Sammies: The American Library Association and World War I (Beta Phi Mu, 1981), Putnam presented his idea of furnishing books to the American army in a meeting with Secretary of War Newton D. Baker who responded positively to the idea. Following that meeting, the ALA Executive Board established a Committee on Mobilization and War Service Plans and Putnam was appointed chair of the committee on April 30, 1917. Putnam presented the committee's recommendations at ALA's annual conference on June 22 in Louisville, KY. The committee felt that an ALA operation on a "vast scale" was desirable. ALA members responded favorably to the recommendations of the committee, and at the end of the conference ALA President Brown appointed a permanent War Service Committee headed by James I. Wyer. Putnam assumed the leadership for the administration of the ALA Library War Service while continuing as Librarian of Congress. 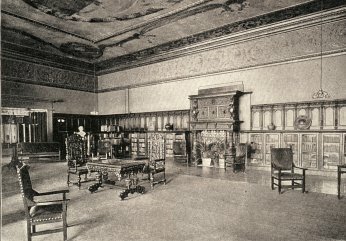 The Library War Service was administered from a conference room in the Library of Congress. Putnam managed the Library War Service until December 13, 1919. Young writes about Putnam's role: "Few individuals are indispensable, but it is difficult to imagine another librarian who could have galvanized the Association's war program as Putnam did. Self-assured, meticulous, and urbane, Putnam was a formidable administrator and an equally good judge of character. He was able to identify and to attract to his staff many of the nation's most promising librarians who were at the threshold of distinguished careers." Jain Aikin Rosenberg in The Nation's Great Library: Herbert Putnam and the Library of Congress, 1899-1938 (Univ. of Illinois Press, 1993) also discusses Putnam's role with the Library War Service. She notes one negative aspect of that role. When selecting camp librarians, Putnam refused to consider applications from African Americans, German Americans, or women. A female librarian was finally hired in May, 1918 shortly before eight "angry female librarians protested the War Service employment policy at the ALA conference that summer." 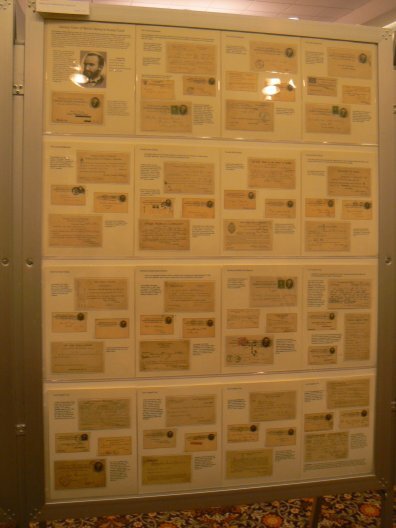 In 1898 the United States Post Office Department (now the United States Postal Service) issued a pre-stamped postal card that was the exact size of a catalog card. 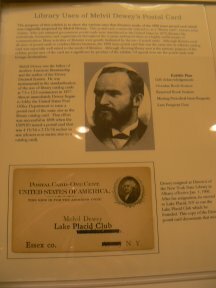 Melvil Dewey claimed that the issue of the postal card was the result of his lobbying of the Post Office Department for a card of that size. I have written a previous blog post about Dewey's postal card. I've been collecting examples of these postal cards used by libraries for over 15 years. Last year I put together a one frame, 16 page exhibit of these postal cards for the big stamp show in Chicago, and last month the exhibit was displayed at the St. Louis stamp show. In both cases the exhibit received a silver medal which was less than I hoped for, but I received some good feedback on improving the exhibit. Yesterday at the stamp show of the Wisconsin Federation of Stamp Clubs in Madison, the exhibit received a first place award (more than one first place awards are given). I will also be displaying the exhibit at the Denver stamp show next month. The exhibit varies considerably from traditional postal stationery exhibits in that it concentrates on library uses of a postal card instead of the postal uses. Postal cards were important tools in conducting day to day library business. The largest use for the Dewey cards in my collection was for the acknowledgment of gifts. Of course there are examples of overdue book notices and reserve book notices. Libraries also used the cards for requests to magazine publishers for missing issues of periodicals, and for requesting copies of publications. There are a host of miscellaneous uses ranging from meeting notices to the collection of library statistics. I have a previous post about the use of the card to announce a meeting of the New York Library Club, and a post about a card to collect data for the California State Library.